Do you dare to durian? Months ago, I “liked” Mental Floss‘ page on Facebook because its seemingly endless supplies of facts, trivia, lists, and quizzes bring light to even the most monotonous of days. I’m always tickled when the editors post something I’m already familiar with; I love comparing their impressions on a particular subject to my own. Earlier today, I read with interest their take on durian. If you’ve never heard of durian, it’s a fruit native to southeast Asia, one that I encountered when I visited Thailand a few years ago. It has the heft and appearance of some kind of medieval weapon–a yellow-green, spiky, football-shaped cannon ball. Durian is banned in hotels and on public transportation in many locales–not out of fear that someone would use it to inflict bodily harm, but because it stinks. Let me be more specific. Durian smells like sweaty feet wrapped in a poopy diaper, propped up on a rotting carcass. It is foul. So foul that I often wonder about the desperate circumstances that led the first human to brave the spiky exterior and offensive odor to actually break open the fruit and raise a piece of its flesh to his mouth. Why did he think durian was going to be safe to eat? Why did he think, with that aroma, that it would be palatable? Was he so hungry that he was willing to risk everything to prove this fruit could provide sustenance? Or were things so bad in his life at that moment that he was actually hoping it would be fatal? I tasted durian when it was offered by a street vendor in Bangkok, because hey, when in Rome, right? Holding my nose and circling around to approach from upwind to control my gag reflex, I tentatively accepted a small wedge of the butter-colored fruit. The texture was unappetizingly soft and slimy, and despite my best attempts to find something positive about the flavor, it tasted exactly like it smelled–like sweaty feet wrapped in a poopy diaper, propped up on a rotting carcass. Water did nothing to chase away the aftertaste–nor did a bottle of warm Coke or a series of chain-crunched Wint-o-green Lifesavers. Hours later, I actually started wishing the flesh of the fruit would prove fatal, just so I wouldn’t have to endure the noxious aftertaste any longer. But not everyone has the reaction I did. 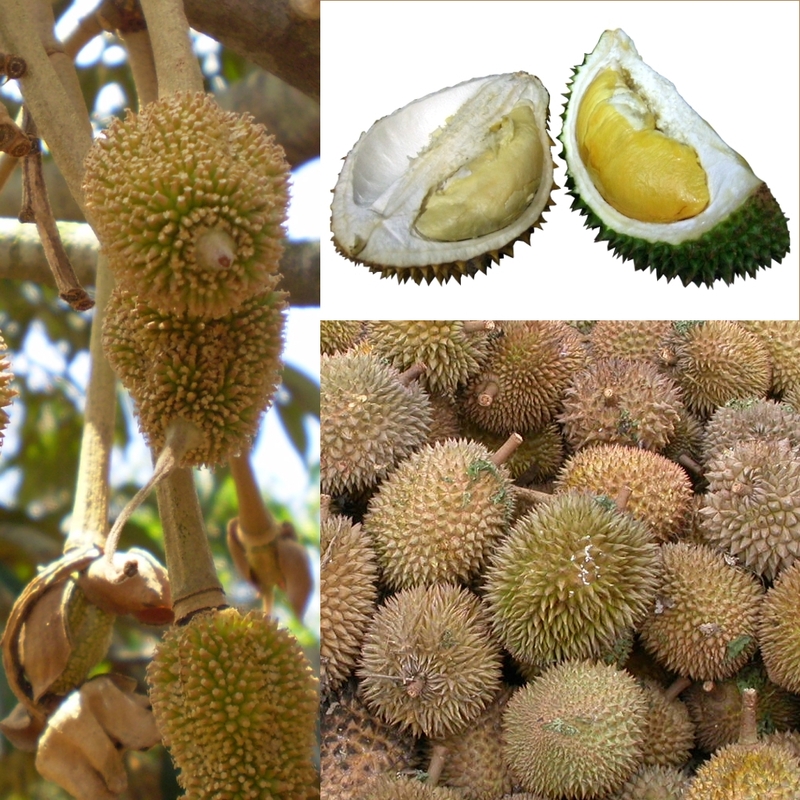 Although nearly everyone will admit that durian stinks, some, like New York Times writer Thomas Fuller, believe the fruit has “overtones of hazelnut, apricot, caramelized banana and egg custard.” Wow. That’s some sophisticated palate, to find all of those flavors hidden beneath the taste of rotting flesh. I won’t be sampling durian again. Frankly, I think Fuller was smoking something when he ate it. But I don’t have the intestinal fortitude to attempt to prove or disprove his claims. Durian has a place of honor on my relatively short “been there, done that, won’t EVER do it again” list. Have you ever tried durian? What did you think? Creamy, fruity, custard-like delicacy or offal from a slimy, putrid, corpse? If you haven’t tried it, would you? Since I trust your taste buds I will pass on this delicacy. It makes me wonder…why would anyone eat the stuff?